While country music fans visit Nashville, Memphis is known as the home of the blues and birthplace of rock-n-roll, with its iconic Beale Street entertainment, star-studded Sun Studios artists, and Elvis's larger-than-life Graceland estate. Foodies will want to plan on sampling as much of the famous Memphis BBQ as they can in between visiting attractions like the Rock 'n' Soul Museum and STAX Museum of American Soul, and while downtown be sure to catch the Peabody Ducks make their march down the red carpet at the Peabody Hotel, as they have done for nearly 100 years. Equally important as its musical fame, Memphis is known for its rich history, especially its connection with slavery and the Civil Rights movement. Highlights of the city's involvement in African American history include the Slave Haven Underground Railroad Museum and the National Civil Rights Museum, which is housed in the infamous Lorraine Motel, where Dr. King was assassinated. Graceland, the former estate of music legend Elvis Presley, has become the ultimate pilgrimage for fans of the King of Rock n' Roll. Elvis purchased the 14-acre property in 1957, and today tourists come to see his former home; admire memorabilia; and visit his tomb, which sits in the Meditation Garden. Tours of the mansion include nearly the entire house, from the elegant foyer and living room where he entertained numerous celebrities to the famous Jungle Room, complete with shag carpets and Polynesian décor. The Trophy Building, designed to tell the story of Elvis's personal life, contains memorabilia like Priscilla's wedding dress, numerous flashy suits once worn by the singer on stage, jewelry, awards, and even toys from Lisa Marie's childhood. Visitors will also enjoy touring the office of Elvis's father Vernon, where the star's personal business was conducted, as well as the restored Racquetball Building. A separate building contains a collection of his favorite cars, including his famous 1955 pink Cadillac, a 1956 purple Cadillac convertible, and the red MG he drove in Blue Hawaii. You can also see Elvis's two airplanes, where you can step aboard his lavish 1958 Convair 880 to admire its gold-plated seatbelts and leather-covered tables. A variety of admission options are available, including a deluxe package with accommodation at the Heartbreak Hotel across the road. 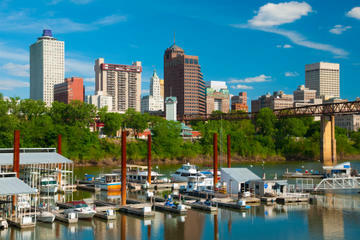 A stroll down Beale Street, nicknamed "home of the blues," is one of the first things to do in Memphis. Here, you will find iconic attractions, like the Memphis Rock 'n' Soul Museum and WC Handy's House, now a museum where the "Father of the Blues" composed Memphis Blues and St. Louis Blues. It's also home to the famous A. Schwab dry goods store, founded in 1876 with the motto, "If you can't find it at A. Schwab, you don't need it!" 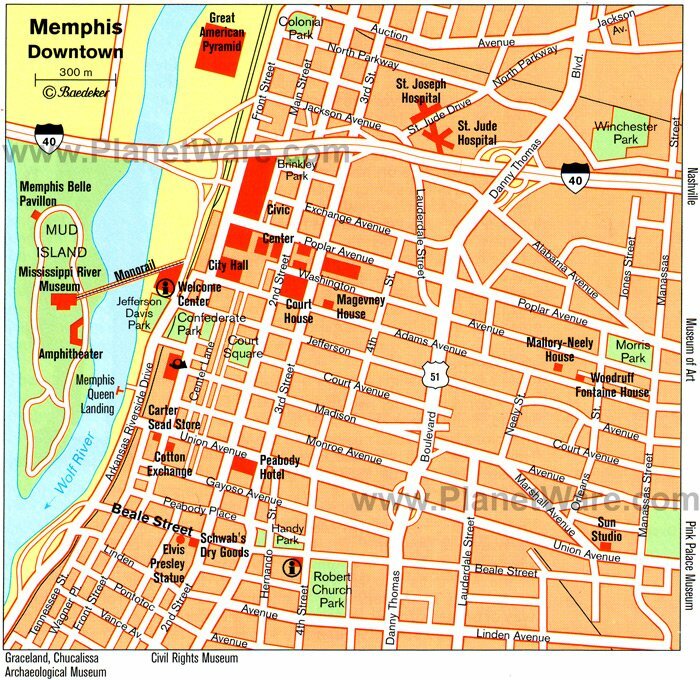 This central area is also home to many other tourist attractions, some of them music-related, such as the Memphis Music Hall of Fame, with its exhibits of local music legends, instruments, memorabilia, and rare recordings. You can also pick up the Memphis Suspension Railway to Mud Island and Mississippi River Park from here. The Memphis Rock 'n' Soul Museum was created by the Smithsonian to highlight musical pioneers from the 1930s through to the 1970s. There are seven fun galleries to explore, each with a digital audio tour including 100 songs. Other exhibits include costumes, more than 30 instruments, and other music-related items. Featured galleries deal with the early years of music in Memphis, Sun Records, soul music, rural music, and culture, as well as disco. Another Memphis music attraction is the famous Gibson Guitar Factory, which offers a fascinating look at the making of these fine instruments. A short distance south of Beale Street, at 406 Mulberry Street, is the infamous Lorraine Motel where Martin Luther King Jr. was shot in 1968. The building is now occupied by the National Civil Rights Museum, which traces the history of civil rights movements in the US. Its centerpiece is the hotel room and balcony on which King was killed, now marked by a white wreath. This thought-provoking museum includes a number of excellent interactive displays, as well as artifacts from the Brown vs Board of Education of Topeka case and the Montgomery Bus Boycott. Mud Island - also known as Festival Island - houses the Riverwalk, a three-quarter-mile-long model showing the course of the Mississippi all the way from Cairo, Illinois to the Gulf of Mexico. At the scaled-down gulf, visitors can hop aboard a pedal-boat and relax on the water while enjoying views of the Memphis skyline. The model is part of the Mississippi River Museum, the central attraction of this family park, with its excellent galleries and a reproduction of an 1870 steamboat. Other highlights include the Hall of River Music and a collection of native artifacts. The island is also home to Mississippi River Park, with its many walking and bike trails, pedal boat rentals, plus a 5,000-seat amphitheater with numerous summer concerts. The best way to get to Mud Island is via the city's suspended monorails. The Memphis Zoo, home to more than 3,500 animals representing 500 species, is one of only four zoos in the country to house giant pandas. Other popular inhabitants include the polar bears, sea lions, black bears, bald eagles, and ravens in a naturalistic environment called the Northwest Passage, while Cat Country is home to both predators and prey, including lions, tigers, cheetahs, and antelopes. Other habitats have family favorites, like elephants, giraffes, penguins, several species of primates including the adorable bonobo, and even a farm animal exhibit. A must-see is Butterflies: In Living Color, open seasonally from Memorial Day through October. Concessions, rides, gift shops, and a discovery center are also available. The STAX Museum of American Soul - one of only a handful of museums worldwide dedicated to the genre - is an exact replica of the original Stax Records studio. The museum features everything soul, including detailed exhibits relating to the stars, the music, and its history, as well as artifacts such as instruments and costumes. Other highlights are a century-old Mississippi Delta church used to display soul's roots in gospel music, and the Soul Train TV show dance floor. The Children's Museum of Memphis (CMOM) is a godsend for traveling parents and features numerous things to do, including hands-on displays to keep young ones entertained. Highlights include a fun cityscape with kid-sized businesses, like an auto mechanic shop and dentist office, an interactive model of Times Square, and a giant Light-Bright wall. Kids can also sit in a flight simulator and a real airplane cockpit, explore the Mississippi River, climb through the arteries of a giant heart, and ride a bicycle on Mars. Other highlights include a ride on the 1909 Dentzel Grand Carousel, a big-top circus experience, painting and sculpting in the art studio, and fun special events. This 4,500-acre park is full of things to do for kids, adults, and even your four-legged family members. Kids' activities include the Woodland Discovery Playground and the Water Play Sprayground, where they can cool off while having fun. Visitors age 10 and up will get a new perspective from the Treetop Adventure Course, which includes net bridges, rope ladders, "Tarzan Swings," and ziplines. Adventure seekers will also love the Laser Tag and paintball games. Paddleboat and kayak rentals are offered, so you can enjoy some of the 20 lakes at Shelby Farms, and bicycles are also available for tourists who want to explore the park's 40 miles of trails, many of which are paved. Animal lovers may want to take a guided ride on horseback; your dog is always welcome on-leash anywhere in the park or can run free in the Outback Off-Leash Dog Park, where they can also cool off in the water. There is also plenty of space for picnics and outdoor games, including an 18-hole disc golf course, and the park has a good restaurant with patio seating that overlooks Hyde Lake, plus multiple food trucks if you get peckish during your adventures. Margaret and Hugo Dixon bequeathed their beautiful Memphis home and French Impressionist paintings as an art gallery and gardens open to all. Set amid 17 acres of woodlands, the property is famous for its English, French, and Italian landscape influences. Artworks include pieces by Monet, Renoir, Degas, and Matisse, as well as some 600 pieces of German porcelain. Another notable outdoor attraction is the Memphis Botanic Garden with its roses, wildflowers, magnolias, and lakeside Japanese garden. Nature lovers should check out the Lichterman Nature Center, a 65-acre wildlife sanctuary with nature trails, a greenhouse, and lake. Sun Studio in Memphis is famous as the recording facility where Elvis Presley, Johnny Cash, Jerry Lee Lewis, BB King, and Roy Orbison began their careers. The studio itself is still used by recording artists, with recent recordings being made by John Mellencamp and Chris Isaak. It's a fascinating look into the recording process, and a free shuttle service is available from Graceland and the Rock 'n' Soul Museum. The Burkle Estate was built near the Mississippi River in 1849 by German immigrant Jacob Burkle as the home of the Memphis Stockyards, during an era when Memphis was the state's largest slave-trading city. Unbeknownst to his slave-owning neighbors, however, beneath the simple-looking home, he had constructed numerous cellars and secret passages that were expressly designed as a safe-haven for escaped slaves. During the tour, visitors learn about the secret message system used to communicate between escapees and Underground Railway operators, find out how they traveled from one point to the next, and get a feel for the slave culture that was so much a part of the Old South. Most importantly, tourists can explore the damp tunnels to get a firsthand look at the conditions endured by so many people who were desperately trying to gain freedom. Luxury Hotels: The boutique River Inn of Harbor Town is a short distance from the downtown core and offers tastefully appointed rooms with stunning river views. A complimentary breakfast and an evening reception are included in the rate. The Peabody Memphis is an iconic Memphis landmark dating to 1925. The hotel is right in the center of the action and is known for the procession of ducks that walk through the lobby to a fountain each day at 11am and 5pm. Walking distance to Beale Street, in a quiet location, is the Madison Hotel, with recently renovated rooms and modern amenities. Mid-Range Hotels: At the top end of the mid-range hotels and offering full suites is the new Residence Inn. This hotel is in a restored 1930s Art Deco building featuring a spectacular lobby with original architecture. The Hampton Inn & Suites occupies a great location half a block from Beale Street and features an indoor pool. Well priced and only 15 minutes from Graceland, the Staybridge Suites has extra-large rooms, with complete kitchens, and an outdoor pool. Budget Hotels: Offering good value downtown in an excellent location near the river and close to the Mississippi River Park & Museum is the Sleep Inn at Court Square. The Comfort Inn Downtown is newly renovated and is just a short walk from the convention center. Just off Beale Street and near the FedExForum is the Vista Inn & Suites, with basic rooms at a reasonable price and free parking. Half-Day Sightseeing Tour: The Memphis City Tour with Optional Graceland Admission is a guided coach tour that has an add-on option, which includes transportation and admission to Elvis Presley's Graceland Estate. The tour begins on Beale Street and continues through the historic Victorian Village and past top sites, like the National Civil Rights Museum at the Lorraine Hotel and Sun Studio. The standard tour is timed to make a stop at the Peabody Hotel to watch the famous Peabody Duck March, after which you can peruse the 120-year-old Memphis institution A. Schwab, a unique old-time general store shopping experience. Full-Day Sightseeing Tour: Operating March through November, the Memphis City Tour and Riverboat Cruise provides tourists with a narrated historic tour of the city's top tourist attractions, including legendary Beale Street, the statues of Elvis Presley and B.B. King, the Peabody Ducks, and a photo-op in front of Graceland Mansion. 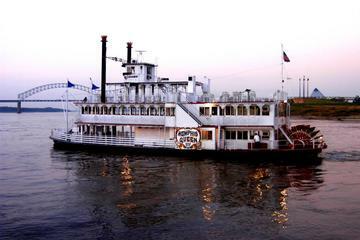 After the land tour, you will hop aboard the Island Queen steamboat, where you can enjoy views of Memphis from the Mississippi river while learning even more about the city's rich history from the captain.